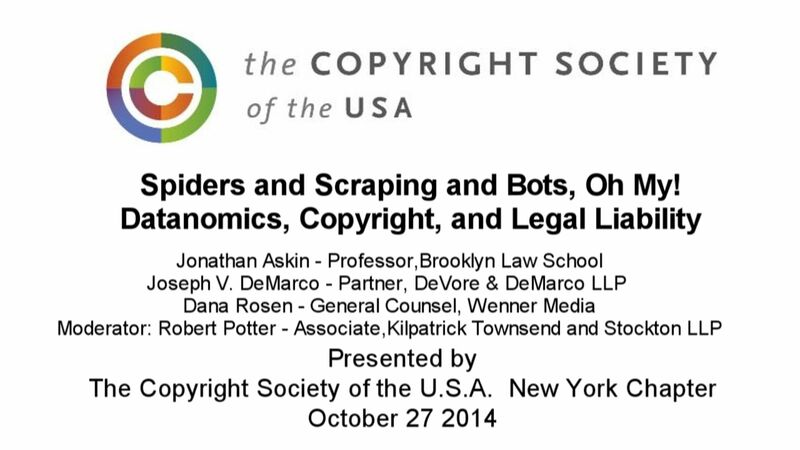 On October 27 2014 the Copyright Society of the USA’s New York Chapter presented a luncheon panel – Spiders and Scraping and Bots, Oh My! — Datanomics, Copyright, and Legal Liability – at the Princeton Club in NYC. A panel looked at the implications of the intersection of big data and data mining with copyright-related principles, including DMCA restrictions and fair use. The discussion covered the legal landscape and assessed whether certain ways of using data may have legal implications. Panel: Jonathan Askin – Professor,Brooklyn Law School; Joseph V. DeMarco – Partner, DeVore & DeMarco LLP; Dana Rosen – General Counsel, Wenner Media. Moderator: Robert Potter – Associate, Kilpatrick Townsend and Stockton LLP. Video/audio is below. On March 26 2014 the Copyright Society of the USA’s New York Chapter presented a luncheon panel – If I Ran The Zoo: Probing The Contours Of “The Next Great Copyright Act” – at the Princeton Club in NYC. A year ago Copyright Registar Maria Pallante delivered the Manges Lecture at Columbia University in which she called upon Congress to enact a program of comprehensive copyright reform. Since then hearings have been held by Senate Judiciary, and the USPTO, to explore the issues involved . The CSUSA convened this panel of experts, and asked them what they would do if they “ran the zoo”, in the hopes of discovering where there might be points of consensus, and intractable strife, and, perhaps, space for deeper exploration. Speakers were Allan Adler: Gen. Counsel & VP, Government Affairs, Assoc. of American Publishers; Victor Perlman: Gen. Counsel, American Society of Media Photographers; Michael Weinberg: VP, Public Knowledge. Moderator: Robert Kasunic: Assoc. Register of Copyrights, Dir. of Registration Policy & Practice. Video is below. 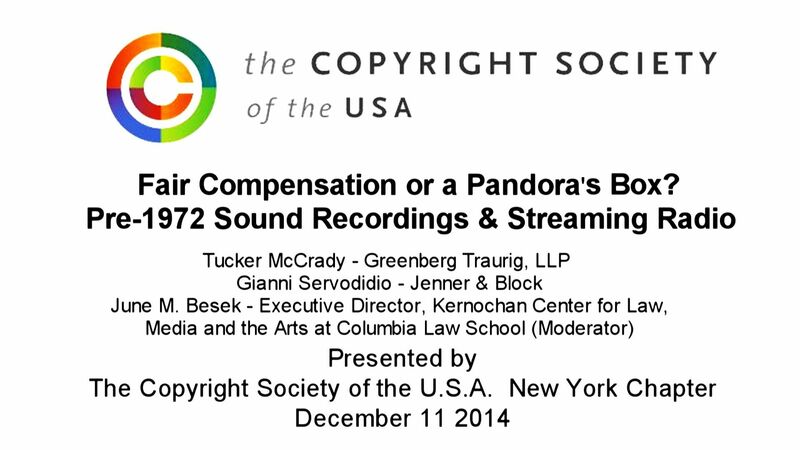 On January 22 2013 the Copyright Society of the USA NY Chapter presented: “Look Before You Tweet (or Post, or Pin): Copyright Enforcement (or not) in Social Media” at The Princeton Club in NYC. A panel of experts examined the copyright issues cropping up around social media sites like Pinterest, Instagram, Facebook, YouTube and Twitter. For example, what are the implications for owner, poster and site for inclusion of copyrighted works on a social media site? When does it make business sense for a copyright owner to take action? How does a copyright owner or user go about creating policies and navigating various terms of service on an ever-growing number of social media sites? And how do these social media sites take licenses for and otherwise approach copyrighted contect posted on their sites? Panelists: Heidi Garfield – Corporate Counsel, Shutterstock, Inc.; Jeanne Hamburg – Partner, Norris McLaughlin & Marcus, P.A. ; and Sacha Tarrant – Director of Digital Rights Strategy & Enforcement at NBA Properties, Inc. Moderator was Eleanor M. Lackman – Partner at Cowan DeBaets Abrahams & Sheppard LLP. Video/audio is below. No transcript. On March 22 2013 the Copyright Society of the USA NY Chapter presented: Game On! Videogame Clones and Killer IP at The Princeton Club in NYC. A panel of experts addressed a a recent flurry of groundbreaking court decisions affecting video game producers as well as IP owners whose characters, stories and music may find their way into videogames with or without permission, as well as the issues raised by game cloning and player-created avatars, in the context of a hypothetical video game from development through MMO expansion. Panelists: Brian Pyne, Director of Legal Affairs and Enforcement, Entertainment Software Rating Board ; Monica Corton, VP of Creative Affairs and Licensing at Next Decade Entertainment, Inc; Emilio B. Nicolas, Attorney, Jackson Walker LLP. Moderator was Stacy Allen, Partner, Jackson Walker LLP. Video is below. No transcript. 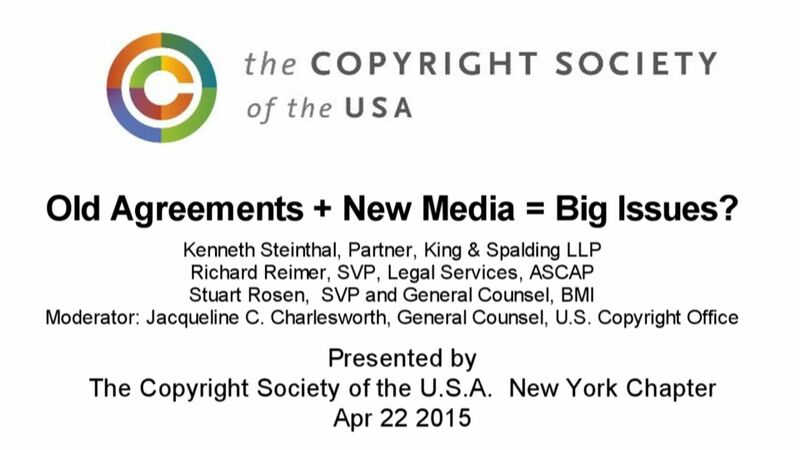 On January 19 2012 the Copyright Society of the USA‘s NY Chapter presented The Future of Digital Licensing: Still Door-To-Door or One-Stop-Shop? . Speakers were Jay Rosenthal,Senior Vice-President and General Counsel at the National Music Publishers’ Association (NMPA) and Anjali Malhotra, Manager, Content Partnerships, Music for YouTube. Moderator was Jim Griffin, Managing Director of OneHouse LLC. Video is below.